What does being a 'Kid of Character' look like? 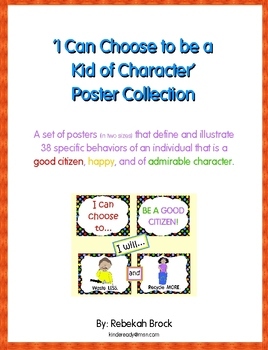 It looks like each of the 38 posters in 'I Can Choose to be a Kid of Character Poster Collection'! Kids, teachers, and counselors alike will love the familiar 'Kids in Action' Kids as they illustrate the behaviors that lead to an individual that is a good citizen, happy, and of admirable character. 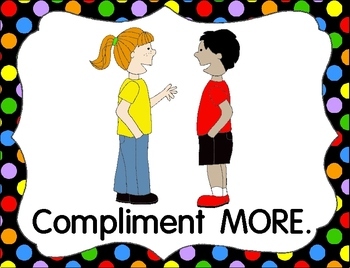 You'll also love the discussion they generate...and the opportunity to work on antonyms, build vocabulary, and create a "community" in your classroom! 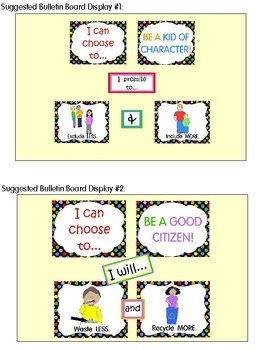 Included in this download are 38 full-color behavior posters (in both full- and half-page sizes), 5 heading posters (so you can tailor the display of your posters in the 'just-right' way for your group), and three bulletin board suggestions to take all the guess-work out for you! 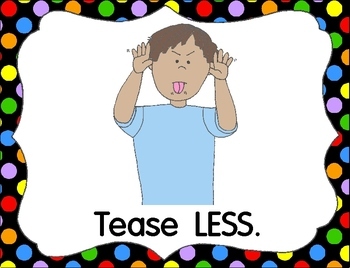 Any clip art, frames, backgrounds, and borders included are my own--all completely original. They are protected by copyright, as is this product in its entirety. If you plan on sharing this product with your team or school, please purchase additional licenses, which are available when you purchase. If you like what you see, please stop back by my store soon! http://www.teacherspayteachers.com/Store/Rebekah-Brock More fun things are on their way!